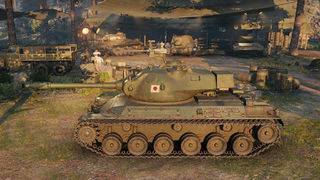 Der STA-2 ist ein japanischer premium mittlerer Panzer der Stufe 8. Einer der ersten japanischen Nachkriegspanzer wurde auf Basis amerikanischer Fahrzeuge entwickelt, unter Berücksichtigung des japanischen Geländes, der Vorgaben durch das Eisenbahnnetz und der kleineren Statur der japanischen Panzersoldaten. Diese Ausführung besaß ein verkürztes Laufwerk und eine größere Wannenhöhe. Es wurden zwei Prototypen gebaut. 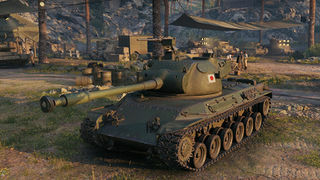 Has one of the highest premium shell penetration of all Tier 8 with whopping 275mm pen. Gameplay of STA-2 is similar to Type 3 Chi-Nu. However, the STA-2 is a bit more mobile and the gun is much less reliable until 9.15. Acceleration is mediocre for a medium, so avoid brawling and beware of everything. The STA-2 can be considered fairly hard to play, hence it is not recommended for purchase for new players, especially considering it's low average credit earning ability. As of 9.15, due to its AP penetration buff, the STA-2 is at the point of being joe average. After World War II, Supreme Commander of the Allied Powers ceased all military manufacturing and development plants in Japan, resulting in Japan losing the technology needed to build and manufacture tanks and armored vehicles. However, due to the Korean War, SCAP ordered Japan to re-militarize, forming armed forces and provided M4A3E8 Sherman and M24 Chaffee tanks. The average height of a Japanese person at the time was too small for the M4A3E8, and drivers had difficulty reaching the clutch pedal with their foot. In addition, the M4 was becoming obsolete. The M24, though it was popular amongst the Japanese crews, was inadequate when facing Soviet T-34/85s, as seen in Korea. Thus, as the tanks in JGSDF service at the time were obsolete/inadequate, the JGSDF was provided with the option of either purchasing the new American built M46 Patton and later, the M47 Patton or develop their own MBT in 1954. Due to the high cost of purchasing American made tanks, and because the M47 did not meet their requirements, the JGSDF decided on developing their own main battle tank, resulting in the development of the STA-1, which became later the Type 61. In this way, the domestic tank development in Japan restarted after a blank of 10 years from 1945. STA-1 is the first prototype built based on request specifications. Because they adopted rear engine front drive system, a shaft lies at a hull bottom. Some stature became high hereby. They designed turret ring lower than an engine deck in order to keep height. Therefore body length grows and had 7 wheels. STA-2 was built with STA-1 by simultaneous progress. STA-2 body was shortened, and the upper hull was flattened. JGSDF executed a field examination with these 2 varieties of prototypes. They attached much importance to a mobility in deep mud, because a lot of paddy existed in Japan. They chose STA-2 which mobility ability was superior to. STA-3 The semiautomatic loading system was produced experimentally for the shell loading, and AA machine gun on STA-3 is operated by remote control. However, because a real operation guarantee was unidentified and these devices exceeded a cost limit, it was omitted in next prototype STA-4.